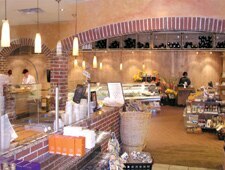 Artisan breads and pastries, to-go dishes, fine chocolates, quality cheeses, retail wines and great coffee. : Fine baked goods, from croissants to baguettes and tarts to danish, are just for starters. We like the hummus above all others in town, and crave the egg salad. Quality raw materials govern all the items. Pasta salads and other prepared dishes are top drawer, and good wines are available, too, as are chocolates, flowers and everything necessary to craft a spur-of-the-moment to-go meal. The cheese selection is particularly well done; local offerings include Capra Gia goat cheese and Sweet Grass Dairy. A Saturday morning ritual is to enjoy a cup of coffee and a pastry at Alon’s then trot across the street to the assembled farmers market and chefs demos. A larger outlet with even more goodies and more seating is located at Park Place shopping center, 4505 Ashford Dunwoody Rd., Dunwoody, 678-397-1781.